The apogee of the miraculous gift of Valentin Serov to paint portraits was the 1899 painting “Portrait of Botkin”. The work received public recognition of European bohemia and art lovers of secular portrait. The world exhibition in the capital of France in 1900 recognized the right of the author of the canvas at the Grand Prix. What is surprising portrait of Sophia Botkina? The artist departed from the tradition of writing secular people in their self-confident arrogance and solemn pomp. The figure of the young wife of the collector Botkin looks fragile, defenseless and modest. 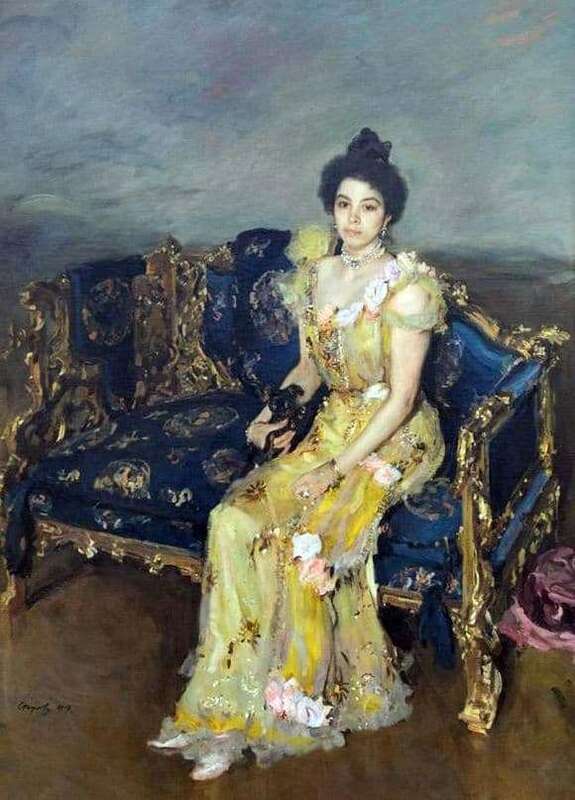 It seems as if the baroque sofa, on which the model sat, and her entire beautiful outfit with a full set of gold jewelry are alien to the personality of this woman. The sofa looks inappropriately large and pretentiously tasteless, with its pomposity and high prices. The model sits on one edge, almost on the edge of the furniture. To tear out the personality depicted from the surrounding background in such a way is a brilliant idea of ​​a portrait painter. Color helps to fully embody this idea. The background and floor are in muted brown, gray and bluish tones. Sofa – dark blue. All attention is automatically riveted to the gentle and beautiful Sofya. Her slim, gathered body is dressed in a yellowish dress, covered with pink buds. The little dog next to the lady is just a tribute to fashion, and maybe the command of the husband to be a married woman. In the eyes of the heroine you can think about her spiritual loneliness. Immersed in himself, the thoughtful gaze is modestly lowered and directed past the picture. The decorativeness and brilliance of the objects of the picture dutifully fade before the author’s lighting of the heroine’s spiritual world. The background and everything on the canvas involuntarily goes to the background, and the gentle sadness in the eyes of a young woman makes the audience feel the participation of Sophia Botkina – the ladies of the centuries forever gone into oblivion.